APPLICATIONS: Ideal for installations where sevice stairs are used to access the roof and frequent use may be expected. Permits easier movement of people, equipment and materials. Standard in galvanized steel. Aluminum is optional. Hinge is on the LONG side. CERTIFICATIONS: RHA (aluminum) models include components or materials that are ASTM certified under Specifications 209-06 and C726-05. Construction: RHA (aluminum hatch): .090" aluminum (11 gauge) with 12" high curb and 3-5/8" wide flange for securing to roof deck. Cover: .090" aluminum exterior and .040" aluminum liner with a TPE rubber draft seal gasket door seal. One inch thick insulation liner is built into the cover. Curb: .090" aluminum, 12" high curb with 3-5/8" wide flange. 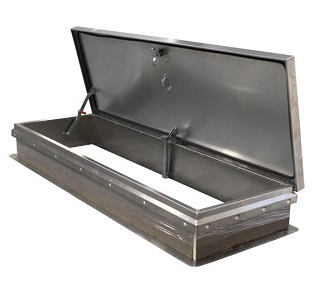 Load/Deflection: Aluminum roof hatch covers have been tested and approved to support a minimum live load of 40 lbs./ft2 with a maximum deflection of 1/150th of the span, maximum negative load of 50 lbs./ft2 wind uplift, and 110 mph wind load when cover is in an open position. Finish: RHA (aluminum hatches): Bonderite® BRONZE color powder coat. OPTIONAL COLORS: White, Tan Red, Yellow or other can be special ordered. $40 additional plus 2 week leadtime. EternaBond AlumiBond AS-6-50, 4 inch wide x 50 foot roll. Heavy aluminum faced peel/stick flashing, roof repair and waterproofing tape. 15 year Eternabond Warranty. Made in USA. Price/Roll. EZ-UP LP-6 Ladder Safety Safety Grab Post. For Roof Hatches. OSHA Compliant. Zinc Plated Steel with Yellow Powdercoat Finish. New Improved 2016 Model. Price/Each.